The 2006 Mussels of the Month. The December 2006 Mussel of the Month is Velesunio ambiguus. The genus Velesunio is widespread in Australasia, from Tasmania to New Guinea. Velesunio, along with other Australian genera like Lortiella, represent the most basal radiation of the Hyriidae. Unlike the hyriids of South America (such as Castalia), Velesunio lacks the characteristic radial beak sculpture. All phylogenetic analyses to-date have placed the Hyriidae at or near the base of the unionoid tree. These primitive hyriids provide us with a view of what the mussels of 200 million years ago might have looked like. The November 2006 Mussel of the Month is Simpsonaias ambigua. Simpsonaias is a monotypic genus unique among the North American assemblage for parasitizing an amphibian rather than a fish. Almost all freshwater mussels have larvae that are parasitic upon fishes: that is the normal unionoid life cycle. Simpsonaias ambigua, also known as the salamander mussel, uses a mudpuppy (genus Necturus) as its host. While amphibians are generally considered distinct from "fishes" at some level, a mussel infecting the gills of a salamander rather than a fish is really not that big of an ecological shift. Freshwater mussels are notorious for their generalist tendencies in host preference, and it has been hypothesized that they periodically colonize new hosts. The October 2006 Mussel of the Month is Arconaia lanceolata. Appropriate for Halloween, Arconaia is a genus of bizarrely contorted freshwater mussels is known from China. Arconaia, known only from China, is to-date known only from two species. One of these, A. huaihensis, was only described in 2003 by Huang & Li. Little has been published on the soft-anatomy and reproductive characters, but the phylogeny recovered in a recent analysis by Huang et al. (2002) suggests that they should share the suite of characters presented by genera like Unio (hooked glochidia, etc.). The torsion of the shell can be either sinistral or dextral. The September 2006 Mussel of the Month is Leila blainvilliana. Leila is widespread in the Rio de La Plata and Amazon basins of South America. A large South American bivalve, Leila blainvilliana is often confused with the widespread and common Anodontites trapesialis, to which it is externally similar. They can be easily separated if one has the shells in hand. A simple examination of the inside of the shell reveals the tell-tale pallial sinus associated with the "siphons," unique in the genus Leila. Don't worry if you have misidentified these in your collection  the holdings of some of the more illustrious institutions possess misidentified specimens, determined by "specialists" in their field. 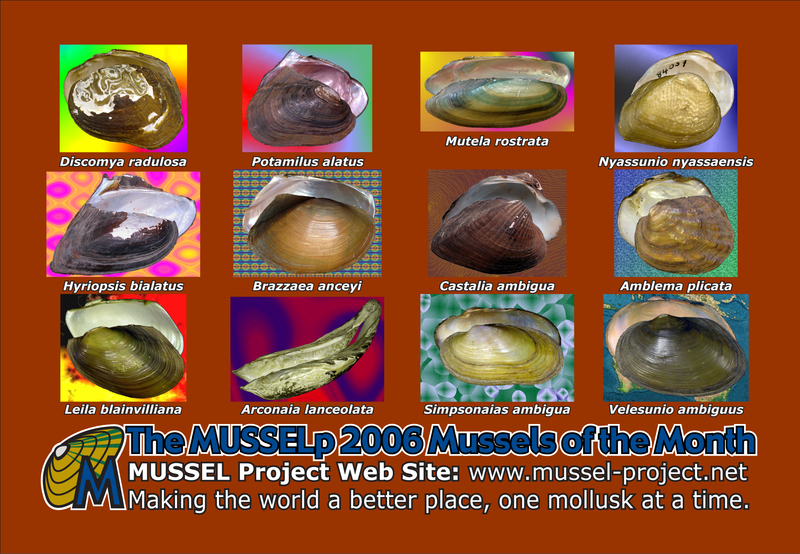 The August 2006 Mussel of the Month is Amblema plicata. Amblema is widespread in eastern North America from the Canadian Interior Basin and the Great Lakes south to the Gulf Coastal Basin. There is really nothing too special about Amblema plicata, except that it is the number one commercial mussel in the United States. It is a common, widespread freshwater mussel in eastern North America. The July 2006 Mussel of the Month is Castalia ambigua. The genus Castalia belongs to the family Hyriidae and is endemic to South America. One of the families of freshwater mussels known to inhabit South America is the Hyriidae. On that continent, the hyriids can be divided into three tribes, each with a reasonably distictive set of shell characters: the Rhipidodontini (e.g., Diplodon), the Hyriini (e.g., Prisodon) and the Castaliini. The castaliines, like Castalia, Castaliella, etc., are generally trigonal in outline, with high umbos and usually with radial sculpture covering most of the disk. An interest feature of many specimens is the rough serration found on the hinge teeth. An interesting feature of Castalia and the other Neotropical hyriids is that their nearest relatives, the Hyridellini, are know from Australia! The June 2006 Mussel of the Month is Brazzaea anceyi. Brazzaea is a monotypic genus endemic to Lake Tanganyika. In honor of our recent visit to the Muséum National d'Histoire Naturelle in Paris, we have chosen Brazzaea anceyi as the mussel of the month  eventually described no fewer than 13 times by Bourguignat! Besides being the object of so much super-nomination, Brazzaea has also been somewhat of a taxonomic enigma. While some authors (e.g., Haas, 1969) have treated it as an iridinid because of its edentulous hinge, Pain & Woodward (1968) showed that its anatomy was clearly unionid. The May 2006 Mussel of the Month is Hyriopsis bialatus. Hyriopsis is widespread in southeastern Asia, from China and Japan south through Indochina to Borneo. The genus Hyriopsis consists of about eight species, the majority of which occur Indochina; a single species each also occurs on the islands of Japan and Borneo. Hyriopsis is valued for its use in the pearl industry. Hyriopsis was also included by Huang et al. (2002) in their study of Asian freshwater mussel phylogeny. The April 2006 Mussel of the Month is Nyassunio nyassaensis. Nyassunio is occurs in both Lake Malawi (= Lake Nyassa) and Lake Tanganyika. Nyassunio is a small genus of only two species, one each in lakes Malawi and Tanganyika. N. nyssaensis, from Lake Malawi (also known as Lake Nyassa), has the interesting distinction that it was first collected by the Livingstone Expedition to the Lower Zambezi River from 1858-1864. Specifically, the type was discovered in September or October 1861 by Dr. David Kirk, the expedition's botanist. While the other mollusks collected on that trip ended up with British natural historians, the freshwater mussels found their way to Isaac Lea at the Academy of Natural Sciences. Dr. Lea was a world renowned expert of freshwater mussels, and as a result specimens were sent to him from all corners of the globe. This deluge of shells facilitated his hobby of naming new species. 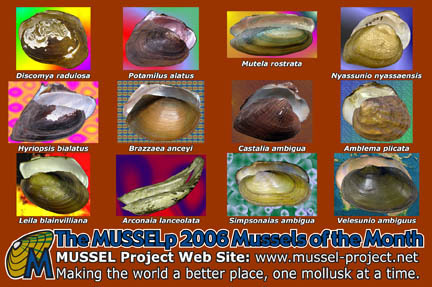 The March 2006 Mussel of the Month is Mutela rostrata. Mutela is widespread in Africa, from the lower Nile south to the Zambezi. Mutela rostata is among the most widespread species in Africa. According to the current concept of this species (see references below), M. rostrata is distribution from the lower Nile Basin, west to Senegal, and south into the Congo Basin. Unfortunately, our work to-date has demonstrated that the current concept of Mutela rostrata is flawed  it is probably far too lumped, especially with regard to the Congalese species. Anatomically, the genus Mutela (like Pleiodon and Chelidonopsis) differs from the vast majority of other freshwater mussel genera in that it has actual siphons rather than widely unfused posterior apertures. The February 2006 Mussel of the Month is Potamilus alatus. Potamilus is one of the numerous genera endemic to the eastern portion of North America. For most of the 20th century, "Potamilus" went by the name "Proptera", and in many collections the nine or so recognized species are still organized under the later name. Potamilus is widespread in eastern North America, including the Interior Basin, the Great Lakes, portions of the eastern Gulf Coastal Plain, and extending south into Mexico. It is also one of the few species to have post-glacially invaded in the Nelson River (Hudson Bay) via the Red River of the North. The January 2006 Mussel of the Month is Discomya radulosa. Discomya is a genus of one or two species endemic to the island of Borneo. Discomya is one of the eleven freshwater mussel genera reported to occur on the island of Borneo in the east Indies. The unionoid diversity known (at least historically) from Borneo is suprisingly high, with about 19 species currently recognized. Little else can be said at this time about Discomya. 2006 MUSSELp Mussels of the Month Postcard.